Dipsacus Linn., Sp.Pl. 97. 1753. Gen.Pl.ed.5.43.1754; M. Bieb, Fl. Taur.-Cauc. 98.1808; Boiss., Fl.0r.3:115.1875; C.B. Clarke in Hook.f.,Fl.Brit.Ind. 3:217.1881; Bobrov in Komarov, Fl.URSS.24:19.1957. Herbs, glabrous or not glabrous. Leaves opposite, connate, entire or divided. Capitula ovoid to cylindrical on long peduncles. Involucral bracts equal to or longer than the receptacular ones. Calyx cupular or lobed. Corolla 4-fid. Stamens 4,2 of which are fertile. Stigma lateral. Involucel 4-angled, the limb with a toothed margin. A genus of 15 species in W. Europe, S. and E. Asia, the Mediterranean region and N. Africa. Represented here by 2 species. Dipsacus fullonum var. sativus Gmel. ex Shmal'g. = Dipsacus sativus (Linn.) Honck. Dipsacus fullonum var. ß Linn. 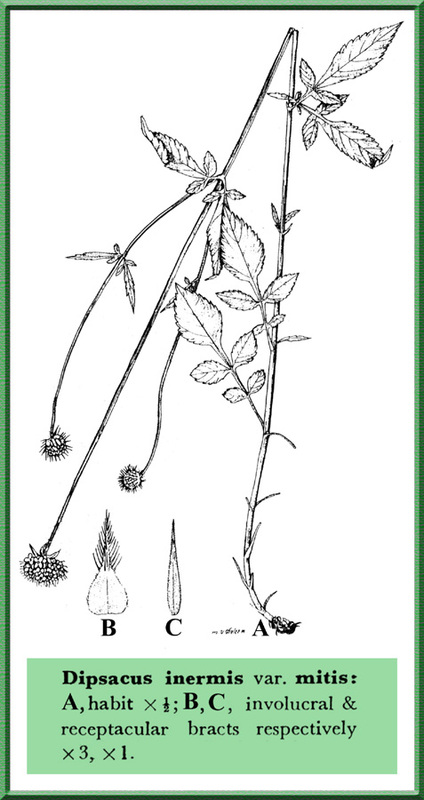 = Dipsacus sativus (Linn.) Honck.